When I was a child I was scared by a movie about Big Foot that played at the local cinema. The movie was “The Mysterious Monsters“, which I took to be a true life documentary. I went to see it with several of my classmates. We left the theater shocked. No one questioned if Big Foot was real, indeed Nessie and the other monsters covered were accepted without question. Our families never sat down and talked to us about what we had seen. It’s hard to remember a time when everyone had the same media input. Three television stations, and a VHS public television station, ensured that during recess we had all seen the same popular shows. The movie shown at our local theatre was seen by almost all the children at school. Our teachers never mentioned Big Foot, even though during art class that week each child drew or molded their own imagined Big Foot. The art teacher was especially clue less, or we were especially bad artists, as she assumed we had all produced “bears”. Time went on, and I still assumed there were Big Foots out there science knew about, and were still trying to capture one for final confirmation. What finally convinced me that Big Foot was not just awaiting discovery in the woods of the Pacific Northwest was my own common sense. The common sense perhaps came from watching National Geographic on TV and reading the magazine for which my family had a subscription. It could be I became suspicious when my biology teacher never mentioned where Big Foot was on the evolutionary tree. My doubts had begun to grow as I grew into my teen years. The final nail in the Big Foot coffin however was delivered by the Mount St.Helen’s volcano in Washington State. All I had read about Big Foot ,and all I had seen about Big Foot, stated that a large group of them were to be found in the Mount St. Helen’s area. If you are old enough to remember the Mount St.Helen’s eruption, it was an incredible event. Everyone knew the volcano was going to erupt, but no one knew quite how massive that eruption would be. When Mount St. Helen’s erupted 57 people died, even though the USGS had convinced authorities to restrict access to the area. No one thought the explosive eruption would be so destructive. Ash fell on 11 states. Ash was removed much as snow from streets and yards and driveways. Parking lots had huge piles of plowed ash awaiting removal. Hundreds of square miles of what had been lush forest, where a Big Foot tribe could hide, was reduced to barren wasteland. Thousands of wildlife were killed and their habitat laid bare. Scientists soon came to study the eruption that surprised everyone. Rescue workers went into the area almost immediately as many humans were accidentally caught in the explosion that was far more powerful than predicted. I found, perhaps not entirely to my surprise, that the search for victims and survivors found no Big Foot casualties. An interesting side note is that the young child the town of Rachel Nevada was named after (famous in UFO lore) died of respiratory problems from the eruption. Her family had moved from Rachel to Moses Lake, Washington. Much of the area became The Mount St. Helens National Volcanic Monument. Scientists still study the site of the eruption and the aftermath. The site is slowly recovering from almost total devastation left by the volcano. Science found many victims of the volcano. The bodies of both wildlife and humans were found. Though it has been many years since the eruption, not one Big Foot bone or even hint of Big Foot DNA has been found. While the area is large, the change from lush forest to flat wasteland should have made it easy to find Big Foot remains. Unless the Big Foots in the area had some prior knowledge of the eruption, which we must remember was a very rare event, then there was no way a group of Big Foot could have escaped the destruction. Explanations, or excuses, I have since heard include that the Big Foot has the “power” to know when to leave an area when there is impending danger. There were real warnings, including earthquakes before the eruption. Certainly an intelligent animal would sense something was different. But even humans with all their advanced equipment and trained scientists underestimated the danger zone for this volcano. The Big Foot group could only escape destruction by a mass exodus from a very large area. Such a movement, with the media of the world focused on Mount St.Helen’s, would have been hard to miss. Alien Big Foot believers have put forth the “beam me up” scenario. The Big Foot used their alien powers to somehow escape the danger. However, most Big Foot hunters believe Big Foot is a real animal. They feel insulted when Big Foot is grouped in the paranormal category with aliens and ghosts. 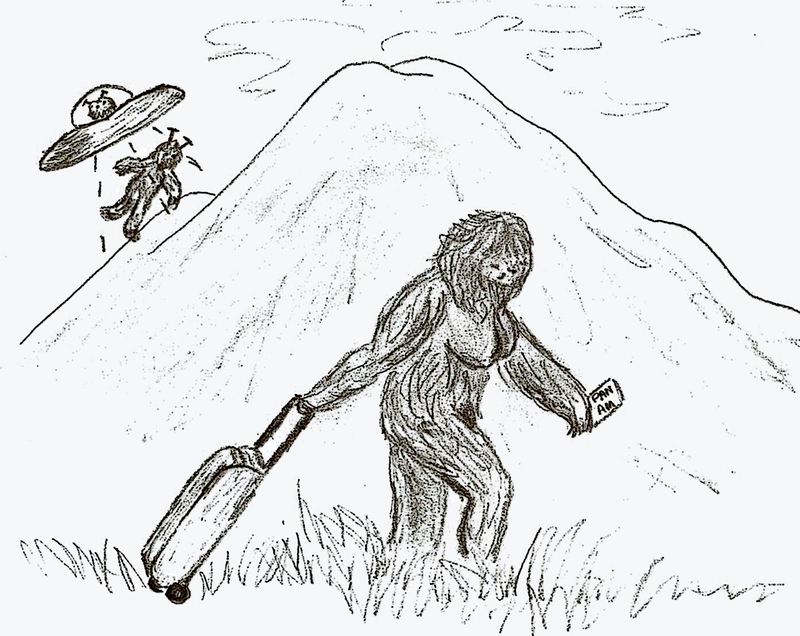 If Big Foot were a real animal, living near Mount St.Helen’s, then there would be have been proof after the eruption. I actually thought, in my 1980’s youth, “I wonder if they will find Big Foot bodies?” When none were found, it was indeed the end of my already tenuous belief in Big Foot. I have since met several Big Foot hunters, they are dedicated and die hard in their dedication to their belief in the animal. The areas where Big Foot might reside now includes much of the continental US. Maybe Big Foot decided living near an active volcano was a bad idea and has spread out a bit. Our own local Big Foot hunters, yes New Hampshire has sightings, are a friendly group. They do get a bit nervous during hunting season. There are perils to tramping about the woods in camouflage. Even though I am now a skeptic, I will gladly embrace any scientifically acceptable evidence of Big Foot being a real animal. I am now a skeptic, so that means I don’t believe before I have evidence, I believe after. « Santa, my children didn’t myth him…. Very interesting take on it. Spielberg said he stopped believing in extraterrestrials because now that cameras are EVERYWHERE, we should be seeing lots and lots of the, and we’re not. I wonder if they’ll ever find Harry Truman. Below me, I was watching 4 or 5 Doe, hanging around a buck scrape. After a while, it was necessary for me to start to get out of the woods. I was up hill and up wind of the deer, so I felt I give it 10 min. or so before I would move. I too was waiting for the buck. I lit up a smoke to set the time limit. About 20-30 seconds after my light up.. I heard a yell, that had to come from a set of lungs larger than any thing / animal – native to the U.S. including Texas. Lived on a farm, had cows, this was more powerful than any moo they could make. I have heard Buffalo, still not the equal. I would describe it as how a deaf person might yell if he had the size and lungs of full grown Buffalo. I exited the woods, wondering just what I had heard. It should be noted I spent my youth/ lived in this area of N.Y. and never heard this before. Next morning went back the the area, and searched for sign of what could have made the sound I heard the day before. Not a leaf out of place in about a hundred yard circle. Went back to wait for that buck. Some time just before the Mt. St. Helens, I was watching a show, which was about Collage Students hunting big foot in the Mt. St. Helen cave areas… I’ll be.. on this show, they played back a recording of almost the exact scream I had heard. Last note, been watching the big foot shows.. sounds on U tube of big foot, nope nothing like what I heard in the woods or on that show.